Cellphone makers have come up with lots of devices that make it easier to drive with both hands on the wheel while using their technology, but in Colorado one common setup for going hands-free is illegal. Using earphones while driving is illegal in the state, even if only one ear has an earbud in it or the headphones have audio coming out of only one side. Rep. Jovan Melton, a Democrat who represents Aurora, says that’s a problem. “I definitely understand and respect that they’re following the letter of the law, but people shouldn’t be punished for trying to drive safely by keeping both hands on the wheel,” he said. Melton says Denver police has written 172 tickets in the past three years for people wearing earphones or a single earbud. This is illegal in the US, and is also illegal here in the UK, it's not common to see drivers in the UK doing this. But the worrying rise in touchscreens in cars could increase the chances of more accidents. 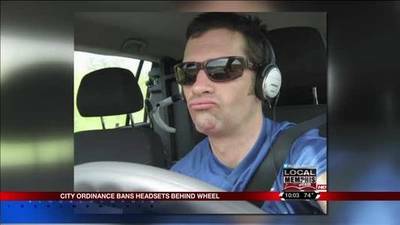 Melton is carrying a bill that would allow motorists to use one earphone or earbud while driving. “A lot of the earbuds that you get with your phone will come with two for music listening, but we wanted to make sure that you are only using one earbud so you can still hear emergency vehicles,” he said. Melton’s bill doesn’t require hands-free devices like earphones when talking on the phone behind the wheel. Melton tried and failed to get such legislature approved last year. But he says he’s not giving up. “I think if we can get this passed it’s just one more step in that conversation which will hopefully lead to a successful (hands-free) bill next year,” he said. The one earbud bill has passed in the House of Representatives and it was approved unanimously in a Senate committee on Thursday. It now moves on to the full Senate. – You cannot have a TV or computer that shows entertainment, social media or email in a position in the vehicle where the driver can see it.